Actually, this book describes a problem which has been solved for all who are consuming WholeVood1 only. I eat no white sugar, only about 5g sodium chloride per day, and only about 10% of my calories come from vegetable oils. This works for more than two years now. So, is this issue off-topic then? Not really, as even I get trapped and start overeating every once in a while, especially when I go out for food. 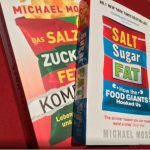 This book explains how you get out of control, simply by consuming too much and the wrong combination of salt, sugar, and fat. If your belly is growing year by year, you might be interested in the findings of Michael Moss.